I am looking forward to the weekend! It’s been a busy week getting ready for the big Martin W Richard Charity event we have on Monday night in Southie at the Paramount. With the help of friends and family it looks as if we are going to have a lot of folks joining us, along with some great raffles and auction items that the community has donated. I am thrilled! Please join us if you are around on March 10th at 6 pm at the Paramount in South Boston. It’s $ 50 dollars per person for some great food and fun for a wonderful cause. Guilty Bakery will also be there with some yummy desserts! Oh did I mention I just turned off my Nike + Fuel band…so I can eat cake! It just was not working with my lifestyle 🙂 I will post the pros and cons of Nike + Fuel band in the coming weeks. Fitbit will be tested after the big Charity Event! 1. Patrice Bergeron’s Suite at a Bruins game of your choice next season for 12 people including food and a meet and greet with Patrice following the game. 2. Autographed Ball, Hat, and Jersey of recent Baseball Hall of Fame inductee Tom Glavin. 3. Autographed picture of current Celtic Brandon Bass. 4. 4 Course dinner prepared by Paramount head Chef Gabe Cheung at your house. 5. Brand New Taylor Made Rocket Ballz Driver. 7. 10 Pass Visit to the New George Foreman Boxing gym The Club. 9. Dinner for two at the Taj hotel. 10. $100 gift card Stefi’s on Newbury. 11. $50 gift card to Steel and Rye. 14. $50 gift card to Beer Garden. 15. $50 gift card to The Playwright. 16. $50 gift card to Stapelton Floral. 17. High Tea for two and S’mores at the Farimont Battery Wharf outdoor firepit. 19. $100 to Sara for makeup application and brow shaping. 20. $50 gift card to Ku Da Ta and an Alex and Ani bracelet. 21. $50 gift card to Sam’s on the Waterfront. 24. $50 gift card to Bringing up Baby. 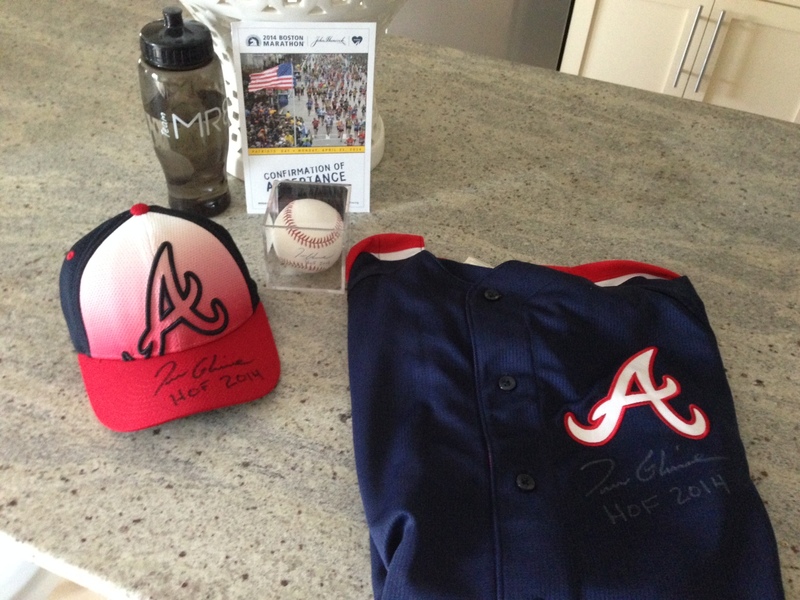 Thanks Again Tom Glavine!!! We are looking forward to the Charity Event on Monday!